ᓈᐹᒡᐦ ᐳᐧᐊᒨ᙮ naapaachh puwamuu Whenever s/he sleeps, s/he dreams. ᒫᑑ ᐃᔮᐦᑯᓯᒡᐦ᙮ maatuu iyaahkusichh. S/he cries, whenever she is sick. These forms are used to describe habitual events relative to other events. In the following beaver hunting story, the verb ᒫᔅᑭᐧᐃᒥᔅᐧᑳᓂᐧᐃᒡᐦ maaskiwimiskwaaniwichh in conjugation (#12b) indicates that their setting up of their camp depended on finding an area with beavers. maakwaach maak aah pimipichinaaniwich, maaskiwimiskwaaniwichh, aakutih kaa chii wiichinaaniwich pitimaa chaa aaschaaniwich. While travelling in winter, if they found an area with beavers, they would stop to set up camp and hunt for the beaver. In the following example, the verbs describe two habitual events: the first coming out of the bear each Spring, and the spawning of the fish each spring. 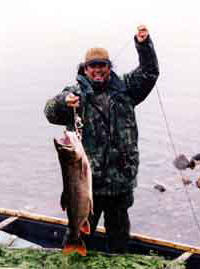 These two events coincide with the bear eating or catching the spawning fish. ushkich aati wiyiwiichh waatikuhch aati siikuniyichh nimaas-h aah aamiyichh aayuwikunh muwaat, nuutaamuwaat. When it (the bear) first comes out in the spring, it eats fish when they spawn, it catches spawning fish. These forms may be used with preverbs, like ᐋᑎ aati or ᐋᐦ aah in the above example. Initial change is required on these verbs when there is no preverb. For example, the dictionary form of ᓈᐹᒡᐦ naapaachh is ᓂᐹᐤ nipaau. The vowel of the first syllable i was changed to aa. Note: the 1p ending -chiht as in nekamuwachiht-h is sometimes pronounced as -tist, but it is not written as such.